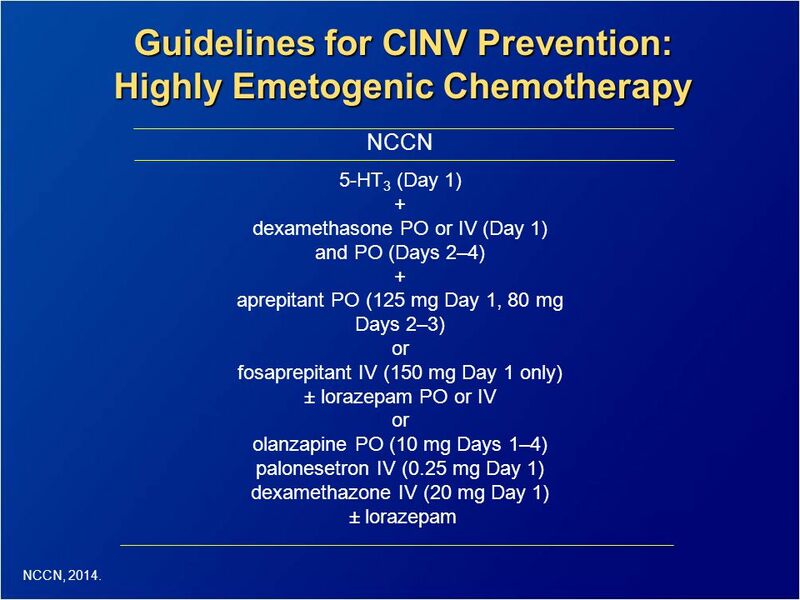 CINV prophylaxis in patients with cancer receiving highly or moderately emetogenic chemother-apy (HEC or MEC). NK1RA agents are expensive and were not registered in Sudan. Recently, reg- imens containing olanzapine, the available and affordable medication in Sudan, were introduced as another option. 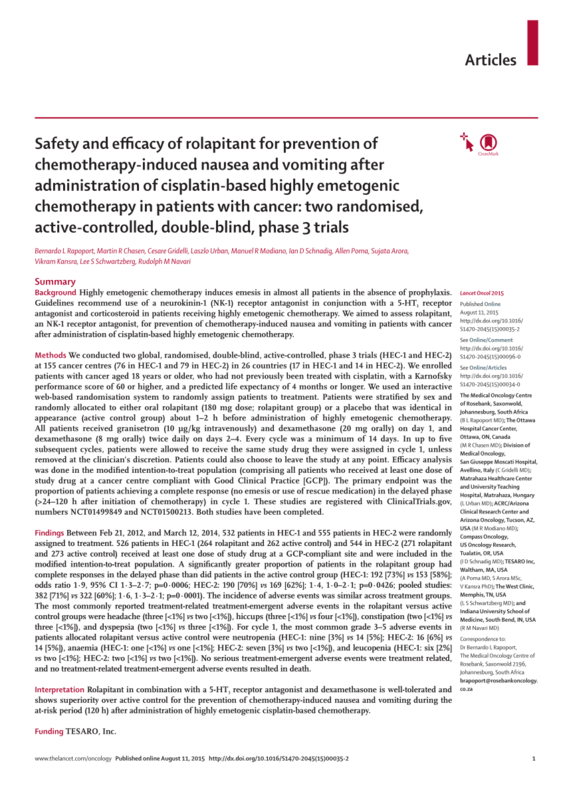 This study aimed to compare the efficacy of an olanzapine-containing regimen with the... Chemotherapy-induced nausea and vomiting (CINV) is a distressing adverse effect. Neurokinin-1 receptor antagonist (NK1RA)�containing regimens are the standard regimens for CINV prophylaxis in patients with cancer receiving highly or moderately emetogenic chemotherapy (HEC or MEC). Conclusions: Single-dose palonosetron was as effective as ondansetron in preventing acute CINV following HEC, and with dexamethasone pre-treatment, its effectiveness was significantly increased over ondansetron throughout the 5-day post-chemotherapy period.... Over the past 2 decades, substantial advances have been made in the management of chemotherapy-induced nausea and vomiting (CINV). This is primarily because of a deeper understanding of the molecular and physiologic pathways critical to CINV. Another randomized trial conducted exclusively in this population that used aprepitant or ondansetron on days 2 and 3, and gave dexamethasone on day 1 only also reported high rates of total control of CINV . Olanzapine is now recognized by multiple consensus guidelines as a necessary component in the prevention of CINV in patients receiving HEC (in combination with an NK-1 antagonist, serotonin [5-HT 3] antagonist, and dexamethasone) as well as for management of breakthrough CINV 14., 22., 23..
For the prevention of acute CINV, the dose of choice should be 20 mg of dexamethasone (12 mg when coadministered with aprepitant) for highly emetogenic chemotherapy and a single 8-mg dose of dexamethasone (12 mg in the NCCN guidelines) for moderately emetogenic chemotherapy .